The 7th session of the Intergovernmental Committee for the Safeguarding of the Intangible Cultural Heritage was held at UNESCO Headquarters in Paris from December 3 to 7, 2012. The session was attended by 2 experts from the Institute, MIYATA Shigeyuki of the Department of Intangible Cultural Heritage and FUTAGAMI Yoko of the Department of Art Research, Archives, and Information Systems. Grenada had planned to host the session but withdrew in August due to fiscal reasons. 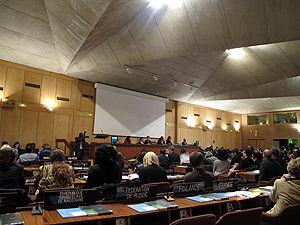 Uncharacteristically, the session was held at the UNESCO Headquarters in Paris. UNESCO’s own fiscal predicament resulted in a number of complaints about logistics, e.g. only limited copies of session documents were available and there was no video streaming of events at the second venue. During the session, 4 nominated files were inscribed in the “List of Intangible Cultural Heritage in Need of Urgent Safeguarding,” 27 were inscribed in the “Representative List of the Intangible Cultural Heritage of Humanity,” and 2 safeguarding practices were registered as “Best Safeguarding Practices.” Nachi no Dengaku [a religious performing art performed at the Nachi fire festival] had been nominated by Japan for the Representative List but a preliminary review by the Subsidiary Body led to the nomination being referred back to the Submitting State. State members of the Committee deemed the nomination to have satisfied the criteria for inscription, so Nachi no Dengaku was ultimately inscribed. This situation was not unique to Japan. Many nominations were inscribed despite being referred back to the Submitting State. A guideline of 1 nominated file per country has essentially been instituted. To limit the overall number of files to evaluate, Committee Members are scrutinizing each nomination rather carefully. Last year’s 6th session of the Intergovernmental Committee for the Safeguarding of the ICH and the June session of the General Assembly of the State Parties to the Convention for the Safeguarding of the ICH had been marked by a rift in opinions. In contrast, the 7th session featured few sharp disagreements between Committee Members. The session consistently featured a generally accommodating atmosphere. Because of regional divisions, countries in Africa had submitted few nominations, but proposals from those states increased considerably during the 7th session. Capacity building has taken place in the region since the Convention for the Safeguarding of ICH took effect, and those efforts appear to have finally come to fruition. For the first time, Japan has been chosen as a member of the Subsidiary Body to evaluate nominations for inscription on the Representative List in 2013. Given this opportunity, the Department of Intangible Cultural Heritage hopes to capitalize on its expertise in order to help with the Subsidiary Body’s evaluations.